It doesn’t happen a lot. But when it does happen, I usually read the book a second time and take a ton of notes. 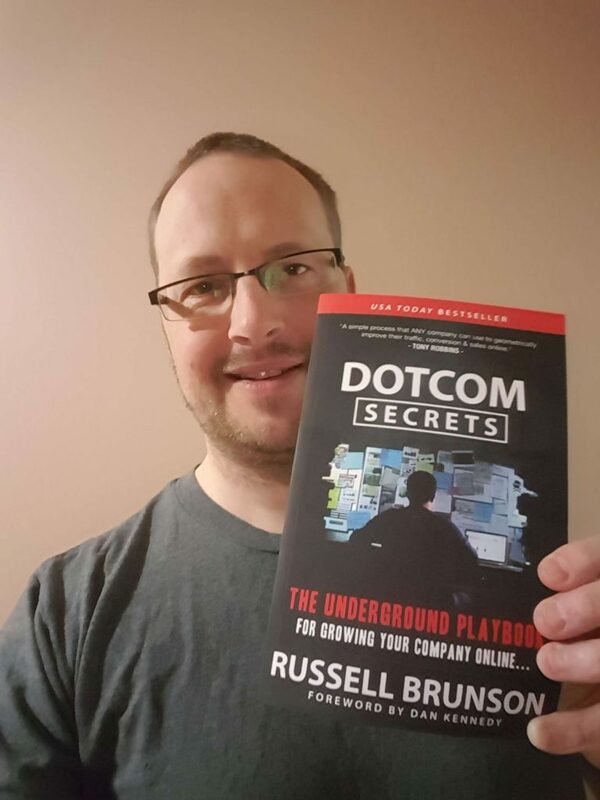 Such was the case with this book, DotCom Secrets by Russell Brunson. When I wrote my book, The Sales Funnel Bible, not a lot of people had heard of sales funnels. I usually had to spend time answering questions like, “What is a sales funnel?” before I could dig into how to improve your business with your sales funnel. But funnels are big now. Really big. And among those raising awareness of funnels is Russell Brunson. He has a piece of software called “ClickFunnels” that businesses can use to market and sell their products and services. It’s kind of a plug-and-play all-in-one software. And, to help him promote ClickFunnels, he has heavily marketed this book to describe funnels (and get people to buy ClickFunnels). And the book is excellent. It’s simple to understand, incredibly practical, versatile for many businesses, and includes templates and scripts. The templates and scripts are worth well more than the price of the book. This book is ridiculously valuable for just about any business, and easily applicable no matter what you sell and what industry you’re in. The book covers basics like a simple stair-step sequence of valuable offerings… and turning that into front-end and back-end offers of funnels… the book also covers the importance of choosing an audience and where to find them… and then gives a number of simple combinations of ways to attract their attention, capture their information, and sell to them through email. At times the book is intentionally simple (because it’s speaking to such a broad range of readers) but that simplicity makes the book easily implementable for most readers. Seriously. Get this book and read it. Now, I’m not going to rush out and trash all the copies of The Sales Funnel Bible. I take a different approach: a little higher level, a little broader (outside of the scope of online businesses), a bit more strategic in some ways, a bit more tactical in others. But Brunson’s book is a solid start for someone who is learning about sales funnels and how the can improve a business. It’s simple, elegant, visually appealing, and highly actionable. And for more advanced readers, I think you’ll still get great value out of it. I wish I’d written it.